Workbooks for Early Readers From Our Favorite – Bob Books! Bob Books, the best-selling learn-to-read boxed sets, has just released companion workbooks to their other reading guides! Nine million books have been sold in the Bob Books program thanks to its silly stories, familiar artwork, and easy-to-comprehend text. Now, for the first time, children can extend their reading journey with these jumbo workbooks, which feature custom content built around each Bob Books storybook. 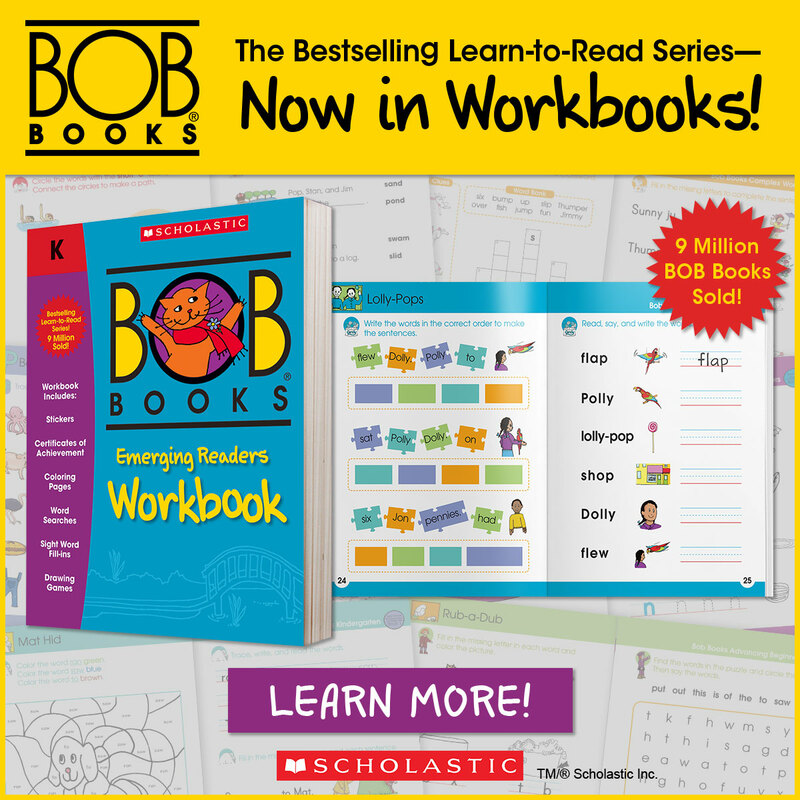 Complete with full-color art and two sheets of stickers, the Bob Books workbooks are the perfect way to engage young readers, increase reading comprehension, and nurture pride and confidence in reading skills. Bob Books boxed sets and workbooks will help your child take the first steps into reading! Bob Books was created by an educator who understands exactly how children learn. She saw a need for an early reading program that met children where they were, at the very beginning stages of literacy. At that time, there was nothing like Bob Books! The books were field tested for years with students. That’s right! Bob Books was first used in the classroom, not at home. Bob Books sets are an ideal investment for any preschool or kindergarten literacy curriculum. They are cost-effective tools with a teaching method that is flexible enough to accommodate many different homeschooling styles. Bob Books has been recommended in many guides for homeschoolers, including Books to Build On and The Well-Trained Mind. A confident reader is a reader for life. That’s why Bob Books sets were designed to give your child early reading confidence – so that they will love to read! Other early literacy programs can teach your child to “memorize” words or “perform” reading well, but Bob Books is not meant to be a chore. Best of all, there are so many ways to make it enjoyable for your child—try the activities that come with the sets and workbooks, use silly voices while reading together and make up songs. How should Bob Books be incorporated into a homeschooling curriculum? Not all children are ready to read at the same age. Be sensitive to your child’s learning style and reading readiness. Practice together; sounds out words and play games. Take many small steps, and be patient. One day you’ll be surprised and delighted to discover your child is taking steps to be a reader! How can I get the most out of my Bob Books? Read Daily-Once you have determined that your child is ready to begin reading, build in daily time to work with the program’s boxed sets and workbooks. Reading together for short periods of time on a daily basis builds progress steadily. Do the Drills-You may find that you want to supplement your reading time with daily reading drills. Typically, 10 minutes is a good length of time to practice reading with drills. Take it Slow-Go slowly through Bob Books, allow plenty of repetition, and reread the stories and activities until your child is completely comfortable with the sounds and their combination into words. Let your child read Bob Books at his own pace. If he gets stuck on a word, sound it out for him and then move on. Use the Workbook-This jumbo workbook ties into three sets: Alphabet, Beginning Readers, and Rhyming Words. Complete with full-color art, over 200 pages of activities, and two sheets of stickers, The Bob Books Emerging Readers Workbooks are designed to hold young readers’ attention, build their reading skills with each activity, and encourage them to continue learning—all leading to increased reading fluency, as well as pride and confidence in children’s reading skills. Use these workbooks as the perfect companions to the Bob Books boxed sets! Millions of parents and teachers alike have incorporated Bob Books into their reader’s curriculum because this program works to build literacy and confidence in young readers. The silly stories, familiar artwork, and easy-to-comprehend text makes this aspect of homeschool curriculum less like teaching, and more like simple fun that leads to impactful learning!